Nyjah Huston My Skate Trophy is So Big TSA Checked it For Drugs!!! 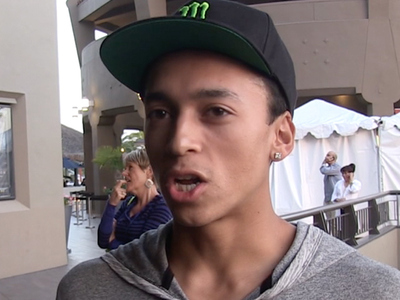 Nyjah Huston's Skateboarding Trophy so Big, TSA Checked it For Drugs! The good news -- dude just claimed his fifth career Street League Skateboarding World Championship title in Rio De Janeiro!! The bad news -- the trophy he brought back home from the event was so big ... TSA had to check it for drugs!!! Huston just crushed everybody in Brazil ... logging the highest final score in SLS series history -- and the gold trophy he earned was the size of his torso. The problem with that?? TSA gave the dude a hard time for bringing it through airport security!!! "They were checking it. But, I'm definitely not hiding any drugs in this thing, that's for sure!" As for Huston's plan for the trophy now that he's successfully gotten it through the airport ... he says it'll look good with the rest of the 1st place awards he's earned over the years. As for any 2nd place trophies he's gotten .... ya gotta hear what Huston does with those!! !